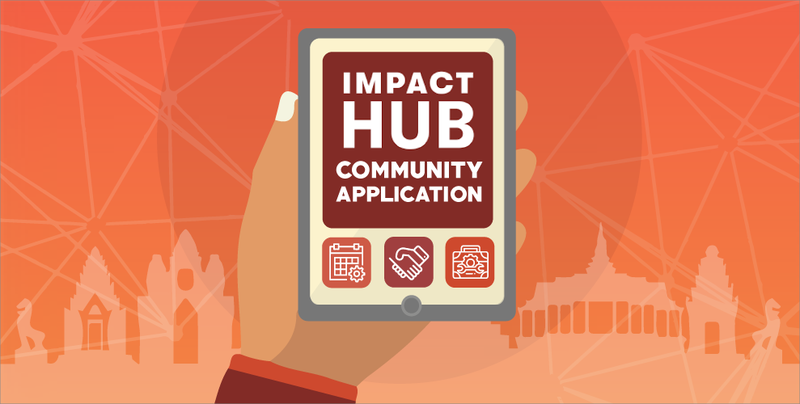 Impact Hub’s Community App is finally being launched to Impact Hub Phnom Penh’s members today! Developed by the Impact Hub Global Team, this app allows members of Impact Hub from all over the globe to join groups, discussions, projects; as well as search for exciting events, job opportunities and useful contacts within the community. With Impact Hub being a global entity with branches spanning in over 95 cities internationally, the launch of this new Community application presents members with the amazing chance to identify other passionate and like-minded individuals who work in similar fields. This especially comes in handy in the increasingly online world we are living in today! Zooming in to a more local context, over 80 of Impact Hub’s Community members are Cambodian entrepreneurs– all of whom are trying to create a positive impact through their exciting ventures. Many have joined the community through Impact Hub’s wide plethora of programs, which include SmartStart, Cellcard Labs, EPIC incubator, and the Hub Entrepreneur Club. Additionally, Impact Hub currently supports over 35 Cambodian startups through programs, incubation, mentoring and coaching. With that, the introduction of this application to the Kingdom will definitely prove to be an avenue for Cambodia’s bright innovators to leverage on to venture and explore new horizons. Furthermore, through digitally connecting its 16,000 strong membership with the app, it helps to transform the way entrepreneurs, impact makers and members connect and collaborate as a whole. Ultimately, it helps to foster and unite a global community that can make an impact in many different ways. For Impact Hub, they truly can see the huge potential in this project, especially in driving global collaboration in the social impact sector. As the Managing Director of Impact Hub Phnom Penh, Olivia Hough, mentioned, “The Community App has unlimited potential for entrepreneurs around the world. It’s great to see our global community digitising and using technology to evolve our offering to our members. We embrace this globalisation and can’t wait to see the collaborations that emerge between Cambodia and afar as a result​.”. All members will have access to the app when they register as a member of Impact Hub Phnom Penh. However, for those who are not members but would like to benefit from the app, they can alternatively register as a Hub Connect member instead. This app will be available on both iOS and Android devices, as well as on web browsers. So if you are ready to connect with other passionate innovators and be part of a cohesive Impact Hub community, you can download the app for yourself here, if you are an Android user, or here for iOS users. Also, for more information on Impact Hub Phnom Penh, you can visit their website or head down to their Facebook Page too!